1. “Do I have the time?” Unless you’re well-versed in card making, graphic design, and crafting, chances are you have no idea how laborious this process can be. If your schedule is already packed, consider buying professionally printed wedding stationery – or have an independent design one-of-a-kind wedding collateral for you. 2. “Do I have the ability?” Be honest. If you’re great with shapes, colors, glue & scissors, then go for it! If you’re a little less left-brained, don’t be afraid to try a ready-made kit that is simple to assemble or seek the help of one of your more artistically gifted friends. 3. “Do I have the resources?” A lot of brides opt for DIY wedding invitations as a money-saving measure. If that’s your primary motivation, you should know that the extra time and effort may not be worth it in the end. If you’re not excited by the idea of making everything by hand, first shop the clearance sections at online boutiques or visit a locally owned print shop to see what they would charge to design and print the invitations for you. I found my dream invites in the clearance section of an online stationer, marked down just enough to fit my budget. When my father & stepmother got married, they took one of her original paintings to a small-town printer and had it replicated as their wedding invitation…for 20% of the cost of my clearance invitations. Being creative is half the fun – especially when it saves you money. 4. 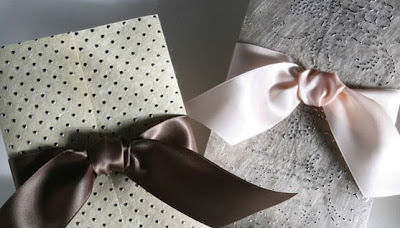 “Do I have the desire?” If you have no earthly clue how to make your own wedding invitations & even less inclination to actually do it, then, by all means – skip it! If you’re hoping to save money, there are many other DIY wedding ideas to help stretch your dollars. Likewise, if you know EXACTLY what you want and can’t find it (or are a perfectionist who doesn’t trust anyone but yourself! ), then creating your own wedding invitations and other stationery is probably a necessary means of preserving your sanity. If you (or a trusted friend!) can answer these questions in the affirmative, then you are certainly ready to start creating your own wedding invitations. If you don’t feel like taking on the entire wedding collateral, mix and match doing some pieces yourself while leaving some for the professionals. Whatever you decide, just be sure it’s what you really want – and don’t let anyone (even me!) talk you out of it. It’s your big day! You’ve got a list a mile long of all your wedding to-dos; in fact, you’re pretty sure there are 37 additional things you forgot to put on the list that MUST be completed in the next 6 months. So, where to start? After you’ve nailed down your ceremony & reception site and wedding date, you’re ready to getting moving on invitations! Shop Around: Take a week or two to visit stationers in your area. Also, be sure to look online as many boutique designers, such as Wedding Invitations by Wedding Paper Divas have full-service websites. If you can’t quite decide between your top 3 choices, most paper companies offer to send samples so you can get the full effect – but keep in mind that it can take up to two weeks for some samples to arrive. Places like Hobby Lobby, Michael’s, Wal-Mart & Target have also begun to offer easy-to-personalize wedding collateral lines. Place Your Order: Once you’ve found the perfect invites, don’t waste any time ordering (and try not to order any later than three months before your wedding date). Allow up to 6 weeks for delivery (most companies deliver in 2-4). It’s important to order wedding invitations as soon as you are able for this reason: mistakes happen. If you allow a “cushion”, you won’t have to freak out if your save-the-dates are a different color than your invitations or if they spelled “Catherine” with a “K” instead of a “C”. Note: If you do end up with a stationery snag, don’t be a brat when you call the company. Yes, this is your big day. Yes, you’re paying good money for their product. But the fact of the matter is that the 19-year-old receptionist had nothing to do with the misprint and you’ll catch more flies with honey. Envelope Stuffing & Labeling: Unless you’ve been a bridesmaid in the past, you’ve probably never experienced the tedium of delicately cramming the invitation, RSVP card, direction card, registry card and that flimsy little sheet of tissue paper into the inner envelope - and then into the outer envelope…250 times. It’s not a bad idea to begin this process 8-10 weeks before you plan to mail the invitations. As busy as you’ll be balancing work, family, and wedding planning it’s wise to plan ahead and give yourself some extra time – or rope in your ‘maids, mom, and sisters for a night of assembly line fun (she with the best penmanship should be reserved for the actual addressing). Don’t forget the stamps! Your local post office offers special postage specifically for weddings, so be sure to ask for it! Note: Though food & drinks make any pre-wedding activity more fun, keep them as far from your assembly line as possible. That red wine stain won’t come out of 250 pearl and ivory invitations. Mailing: You’re almost finished! Since we all know that the postal service delivers top-notch precision and accuracy when handling our mail, you would be wise to mail out-of-town guests’ invites 6 weeks before the wedding date. In-town guests can typically be mailed 4 weeks out – but I say, why make TWO trips to the post office? Just dump them all in your nearest blue box at the 6 week mark to be safe. That gives everyone a little more time to RSVP – which means fewer last minute calls to your caterer to up your dinner count.